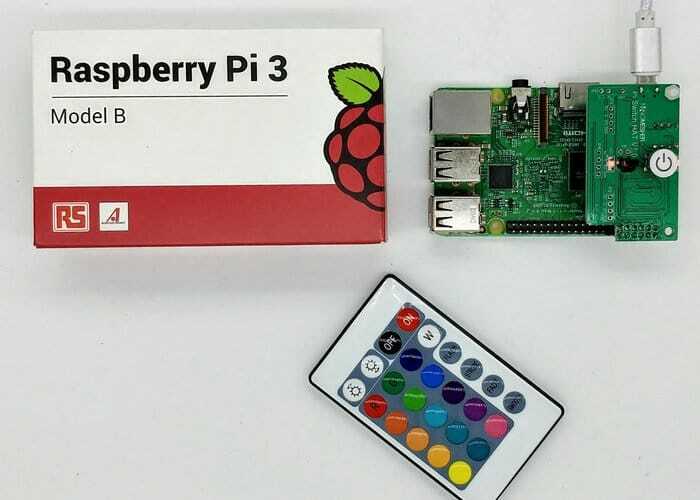 Raspberry Pi enthusiasts might be interested in a new Raspberry Pi Switch HAT created by Andrew Lai that allows users to easily remote control a wide variety of different Pi projects. The new Pi Switch HAT builds on previous projects created by Andrew and now includes extras such as support for the Kodi home entertainment application, optional display, LED, Infrared control and i2c ports. Watch the demonstration video below to learn more about the new Raspberry Pi HAT which is available to back via Kickstarter with pledges starting from just £12. If the Kickstarter campaign is successful the Raspberry Pi Switch HAT with remote control will start shipping out to backers during April 2018. The project also offers a choice of generic all multimedia remote controls to accompany your Pi Switch HAT..
Other new features of the latest generation of Raspberry Pi switch HAT include the ability to plug it directly onto your Pi mini PC without the need for any jumper cables, infrared remote signals of all buttons can be read directly from Pi, Kodi support, 1 x LED controllable via GPIO and 3 x i2c ports. As well as optional 0.96-inch OLED Display offering users a small but useful resolution of 128 x 64 pixels. With optional SENSIRION SHT31 temperature and humidity and BOSCH BMP180 pressure sensors and a choice between generic and multimedia remotes all of which can be purchased separately if required in addition to the HAT. For a full list of all available pledges and specifications jump over to the official Kickstarter campaign page by following the link below. The official Raspberry Pi Foundation has also announced the launch of their new Raspberry Pi 3+ which offers a more powerful mini PC equipped with a dual band wireless connectivity. For more information jump over to our previous article located here. If you enjoy building Pi projects you might be interested in our comprehensive list of Raspberry Pi displays, HATS and small screens.